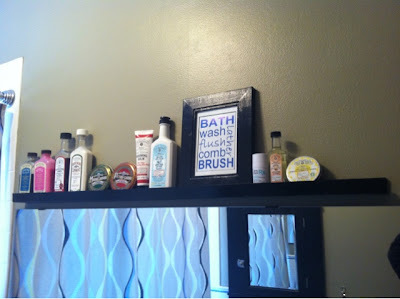 The Mom Standard: DIY Home Decor on a Budget Series: Bathroom Shelf--FREE! DIY Home Decor on a Budget Series: Bathroom Shelf--FREE! Our tiny bathroom was running out of space for our regularly used essentials. 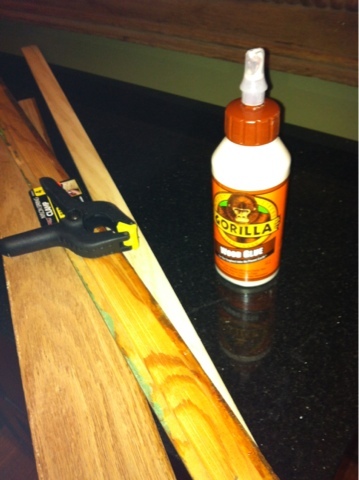 I scrounged the house for supplies and in a couple days made a shelf that is perfect for our needs! AND it cost me a total of $0! Yep, nothing! I love these types of projects! 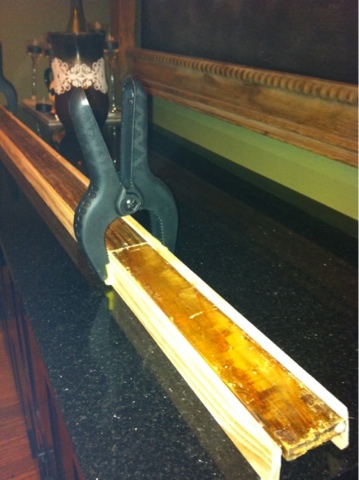 Glue your shelf pieces together, clamp to hold and let dry overnight. Next day, reinforce with some trimming nails on each side. Paint, dry, hang! Simple! See how old that trim is? I'm glad we held on to it! Hung right above our mirror. Yes, those are all JR Watkins products. Only the best in this house!